CPT RV composite panels are ideal in the RV industry where lightweight, strong, and durable design is needed. 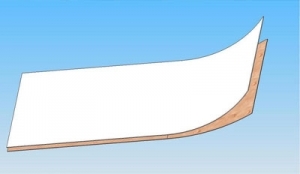 Although more expensive than traditional construction, composite panels are used where traditional building materials are unable to provide the performance required. Typical applications include ramp doors, side walls, decking and slide outs. 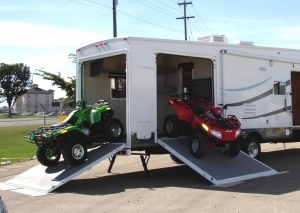 RV Composite panels systems can be used to make lightweight assemblies that can be turned into structures like campers, travel trailers, utility boxes and car haulers. CPT RV composite panels can be designed and built as high strength structural components for the most demanding of applications, or as structural insulated panels for standard RV requirements. Honeycomb cored panels provide exceptional strength performance for units that need to be designed to be lightweight and high strength. Foam cored panels offer outstanding insulation value, while providing a modular design that is lightweight, strong, versatile and reliable. 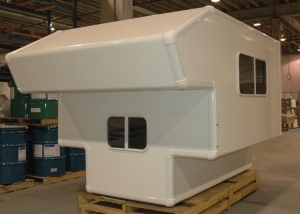 CPT also produces a filon-luaun underlay panel used in the RV market as an exterior one piece skin. These panels are ideal for producing flat, dent resistant RV side wall skins. CPT composite panels offer the widest range of core and skin materials in the industry to provide custom solutions to the RV industry. CPT panels can be supplied in raw sheet form, cut for profiles and sizes, or fitted with edge trimming to make them a finished assembly. Our highly experienced sales and engineering teams can assist you in choosing the best composite panel or panel system to meet your requirements.